We design, build, and service custom gunite (shotcrete) pools and spas. 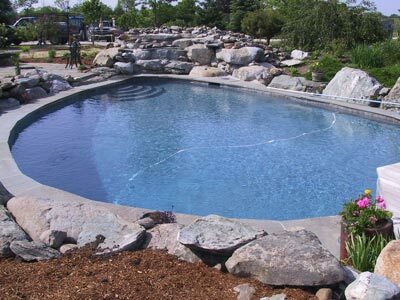 Gunite is the ideal material for building freeform, long-lasting, high-quality pools—they can be shaped and molded to fit any vision, and they are easily maintained. We put our experience and our disciplined process to work for our clients. Take a look through our portfolio to see some of the work we've done for other homeowners, and imagine a pool of your own. If you are considering a pool or spa for your property, we would be delighted to meet with you. "Dear Denise, Thank you for all your support during the pool project. I certainly think that your dad is proud of the way you work with customers. Please tell Arthur & David how impressed we are with their construction. I mean to put all this in a more formal way. You can always use me as a reference. And it is beautiful!"